Forms+Surfaces’ sleek, minimalist Light Column fixtures are more versatile than ever. We’ve added two new standard shields to our list of available options for the line, and we’ve also made it easy to customize shields to meet your specific needs. 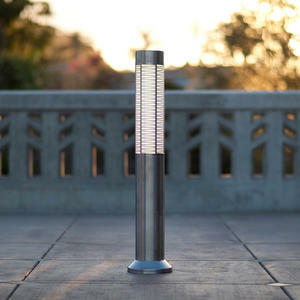 Adding a shield to a Light Column allows you to completely change its look and feel. Whether you want your Light Column to be whimsical, elegant, organic or modern, you can find or create a shield that conveys your vision. You can also customize shields with branding or wayfinding. Most shields can be specified in 180-degree or 360-degree configurations. Our popular Scape pattern, which reflects a rolling landscape, is now offered as a standard shield and is also available on our Universal Receptacles, Orbit Receptacles, or as a Screen pattern. This allows you to easily extend a single design motif throughout a space. Kente, available as a Screen as well, has also been added as a standard option. 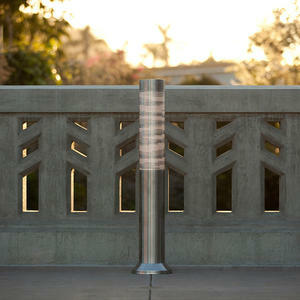 Our Light Column line consists of Light Column Bollards and Light Column Pedestrians. 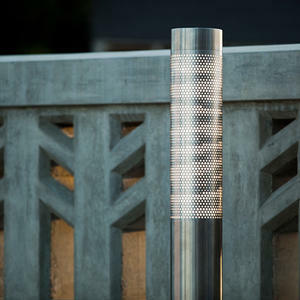 While similar outdoor fixtures are often made of aluminum, Light Columns are made entirely of durable stainless steel and are still competitively priced. Light Column Bollards are offered with linear LED or fluorescent lamps, and come with an optional embedded security core to protect against vehicle infringement. 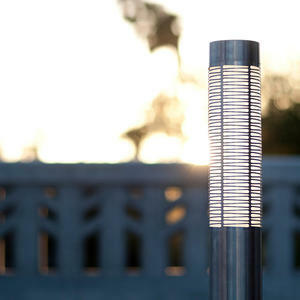 Contact us to find out more about our versatile Light Column fixtures and how they can enhance your next project.